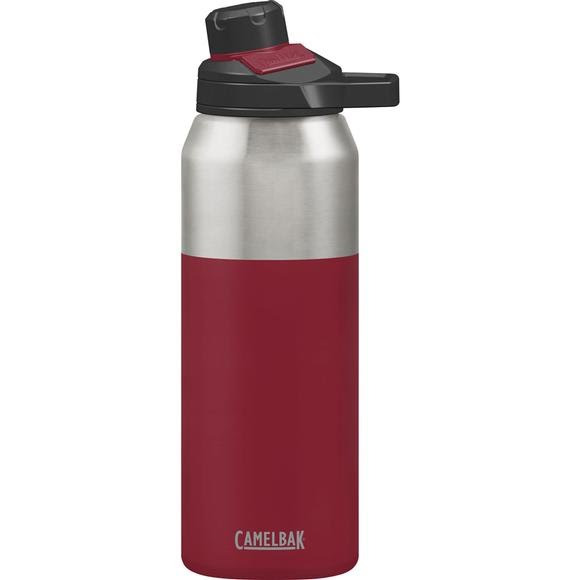 With Camelbak's 32 oz Chute® Mag Vacuum, you can get a cold drink and a smooth pour every time. The new magnetic top keeps the cap out of the way while you drink. This vacuum-insulated bottle keeps liquids cold for 24 hours (even longer if you add ice), and hot for six. With Camelbak &apos;s 32 oz Chute® Mag Vacuum, you can get a cold drink and a smooth pour every time. The new magnetic top keeps the cap out of the way while you drink. This vacuum-insulated bottle keeps liquids cold for 24 hours (even longer if you add ice), and hot for six. The sturdy, double-walled steel design keeps condensation from collecting on the sides of the bottle, and the powder-coat paint job adds some extra color. The narrow-mouthed opening also makes it easy to drink and pour without spilling, so you won&apos;t waste a single drop. After all, nobody wants to refresh or refuel with a lukewarm drink. Double-walled vacuum insulation maintains your drinkâ€™s temperature for hours and prevents condensation from collecting on the vessel.